Fostair NEXThaler (formoterol/beclometasone) is the first dry powder inhaler delivering extrafine drug particles to be launched in the UK. 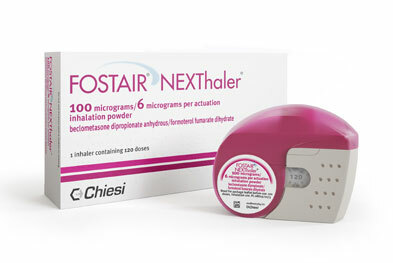 Fostair NEXThaler (formoterol/beclometasone) is licensed for the regular treatment of adults with asthma. Fostair NEXThaler contains the long-acting beta2 agonist, formoterol, and the corticosteroid, beclometasone. The NEXThaler device is a breath-actuated dry powder inhaler which delivers the combination of drugs as extrafine particles to improve lung deposition and allowing a lower dose of corticosteroid to be given. The manufacturer states that the device has been developed to be "intuitive to use" and utilises a dose counter that only decreases when a dose has been correctly inhaled (compared with existing dose counters that decrease when a dose has been primed or loaded), with the aim of "accurately tracking adherence". Prescribers should note that the beclometasone doses in Fostair products are not equivalent to those delivered by non-extrafine formulations. Owing to the difference in particle sizes, 250 microgram beclometasone administered via a standard inhaler is therapeutically equivalent to 100 microgram beclometasone in a Fostair product when given via the new NEXThaler device or the pre-existing pressurised metered dose inhaler (pMDI). 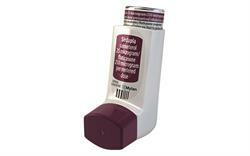 The efficacy and safety of formoterol and beclometasone for the treatment of asthma is well established. The Fostair NEXTinhaler device was compared with the Fostair pMDI in an 8-week randomised, double-blind, four-arm parallel-group study (NEPTUNE) in 754 adults with controlled asthma. Investigators found the NEXThaler device to be non-inferior to the existing pMDI in terms of change from baseline in average pre-dose morning peak expiratory flow.